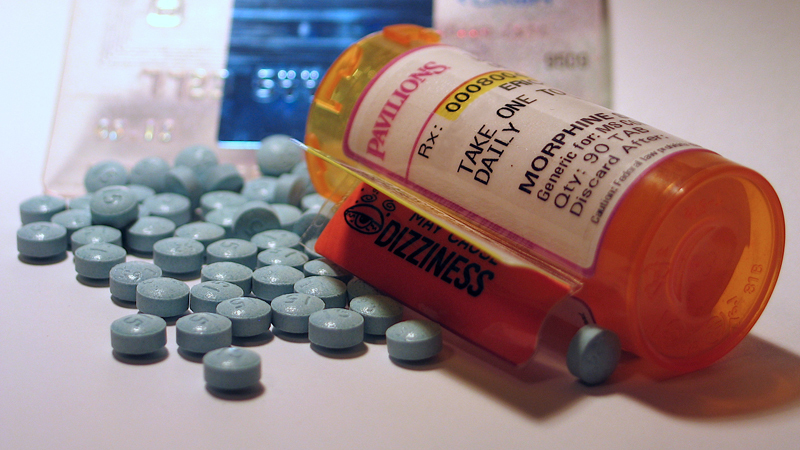 Morphine is a common narcotic pain reliever with significant side effects (sfxeric/Flickr). Morphine is a powerful narcotic, commonly used to treat moderate to severe pain from surgery, injury and chronic health conditions like cancer or osteoarthritis. However, morphine has many negative side effects. It can cause drowsiness, nausea, vomiting, dizziness and constipation. More troubling, people can become dependent on it. According to the Centers for Disease Control and Prevention, narcotic dependence and overdose deaths are a growing health problem in the United States. Narcotic sales quadrupled from 1999 to 2010 and narcotic-related deaths more than tripled from 1999 to 2012. More than 2 million people in the U.S. currently abuse narcotics. In order to address this problem, researchers have long searched for alternative drugs that effectively relieve pain without inducing dependence as morphine does. A team of researchers now believe they’ve found a good candidate for such a drug, although it will be a long time before this drug, if it proves to be effective, is available in stores. These researchers are studying their new kind of pain reliever using an ultrabright, ultrafast X-ray source called the Linac Coherent Light Source (LCLS), which is located at SLAC National Accelerator Laboratory. The LCLS creates the brightest X-ray source on the planet, which researchers need to accurately study the structure of tiny, nanoscale drug compounds. Narcotics are also called opioid pain relievers, because they block the sensation of pain by binding to opioid receptors within the pain pathway of the brain. A drug can provide pain relief by binding to one of three types of opioid receptors in the brain: delta, mu and kappa. Narcotics like morphine target the opioid mu receptors. The problem is that long-term use of morphine reduces the number of available opioid mu receptors. As a result, tolerance develops so a higher dose of the drug is needed to achieve the same level of pain relief. Ultimately, prolonged use leads to physical dependence -- which is when the neurons adapt to the presence of the drug and function normally only when it's in the body. Previous research has shown that administering morphine with another drug that simultaneously blocks the opioid delta receptors prevents this morphine-induced tolerance and dependence. Researchers just need to find the right drug combination with minimal side effects. Recently, a team of researchers, led by University of Southern California chemistry professor Vadim Cherezov, developed a drug that activates opioid mu receptors while blocking opioid delta receptors. Their drug is derived from a specialized peptide – a naturally occurring chain of amino acids. Their research results were reported in the February issue of Nature Structural and Molecular Biology. Unfortunately, it is very difficult to study new opioid compounds like the one Cherezov recently developed. In order to understand the structure of new compounds, scientists usually grow crystals of the compound and then hit them with X-rays. By measuring the angles and intensity of how the X-rays bounce off the crystals, they can produce a three-dimensional picture of the crystal structure. However, it can be difficult to grow crystals large enough to use this standard method, called X-ray crystallography. Plus, you typically need to freeze the crystal to make it more rigid, rather than study it in natural conditions and temperatures. On top of that, a conventional X-ray beam might blast and destroy the small crystal before you can collect enough data. Instead, Cherezov’s team used the Linac Coherent Light Source to perform their experiment on tiny crystals, very fast, and at room temperature. LCLS X-ray pulses last just a quadrillionth of a second, or 100 times faster than it takes light to travel the width of a human hair. Yet they are a billion times brighter than a conventional X-ray source. Using this unique X-ray source with higher-intensity, very short pulses, Cherezov was able to use smaller crystals and still collect terabytes of structural data before the crystals vaporized. Each crystal the research team prepared was a millionth of a meter and contained many copies of their new opioid compound bound to an opioid receptor. The team placed the crystals in a toothpaste-like gel to simulate the receptors’ natural environment, and then injected a thin stream of this gel into the path of the LCLS X-ray beam. The resulting structural model was precise enough to show how the new drug molecules bind with the receptor. This atomic-scale map should help scientists develop pain-relieving drugs with fewer negative side effects. It's likely to to take years, though, before it can be tested in humans. “This work will provide a solid basis for the design of a new generation of pain relievers with reduced dependency,” Cherezov said in a press release. Cherezov’s experiment is just one of many performed at the Linac Coherent Light Source. The LCLS is a Department of Energy User Facility where approximately 600 scientists conduct groundbreaking experiments each year, across many fields, including chemistry, biology, material science, technology and energy science.